The University’s Enterprise Hub, which runs the Employability Points scheme, is currently looking to hire a Student EP Ambassador for the forthcoming academic year. This is a paid position (£500 per term, 5-hours per week), for one student to work closely with academic schools, professional services and student societies to promote the EP Scheme to current Kent students at both Canterbury and Medway campuses. In the past, EP Ambassadors have attended networking events, held pop-ups, delivered shout-outs and much more. The University’s Development Office is hiring twenty-five student callers, to work on their telephone fundraising campaigns. This work will be shift-based, during the last two weeks of June. 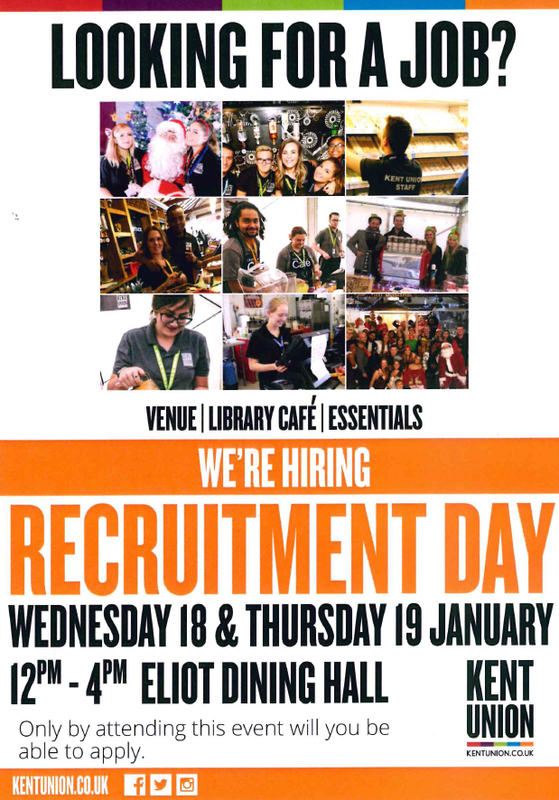 For more details, see the Kent Union Jobshop website and the job description below. The Partnership Development Office, in conjunction with the University’s partner secondary schools, would like to introduce you to an exciting teaching experience scheme that we are piloting from September 2017, exclusively for Kent students. The Partner Schools’ Teaching Experience Scheme has been designed to allow Kent students, who have an interest in entering the teaching profession, a unique insight into teaching, by offering training and paid work opportunities in the classroom. Part 1 – Students in their penultimate year of study can access paid School Experience Placements, supporting pupils in the classroom in one of the University’s partner secondary schools. Stage 2 – Students in their final year of study can apply to take on a Direct-Entry Teaching Internship, receiving training and paid work delivering pre-written teaching materials to pupils in our partner schools. If suitable trainee teacher vacancies arise within our partner schools during this year, this placement could lead to an offer of a salaried direct-entry teacher training position at the school upon graduation. To book a place at one of these sessions, please email Olivia McGlone, O.McGlone@kent.ac.uk. If you wish to apply for the scheme, please go to www.kent.ac.uk/ambassadors/vacancies and then select ‘outreach vacancies’. If you need any further information, please contact Rebecca Spink on r.spink@kent.ac.uk. Following the enormous interest in the two recently advertised Student Research Assistant roles, the School of History is now seeking to appoint a Student Research Assistant to support Dr Andrew Cohen with his research project, ‘’Labour Migration and Labour Relations in South and southern Africa, c.1900-2000’. Following on from the advert for SRAs to support Dr Emily Manktelow’s project (closing date 23:59 on Sunday 29th January), the School of History is also seeking to appoint a Student Research Assistant to support Dr John Wills with his research project, ‘Depictions of America in Videogames’. The Development Office is recruiting 38 student fundraisers to take part in the 2016 autumn telephone campaign. They are particularly looking for students who are truly dedicated to charitable giving, genuinely enthusiastic about the University and able to demonstrate this to the University’s alumni. Students who have a good phone manner, excellent verbal communication skills and a willingness to ask for donations would be desired. On-Campus Promotions is recruiting a team of ambitious, enthusiastic and confident Brand Ambassadors to work exclusively for BAE Systems to promote their career opportunities on campus for the academic year starting September 2016. The hired Brand Ambassadors will need to be available to attend a training day at BAE Systems on 19th September 2016. This training day will provide guidance for undertaking the role of Brand Ambassador and will equip you with the relevant skills training. The deadline for applications is 19th August. For more information and to apply, head to http://bit.ly/2azwHSf.